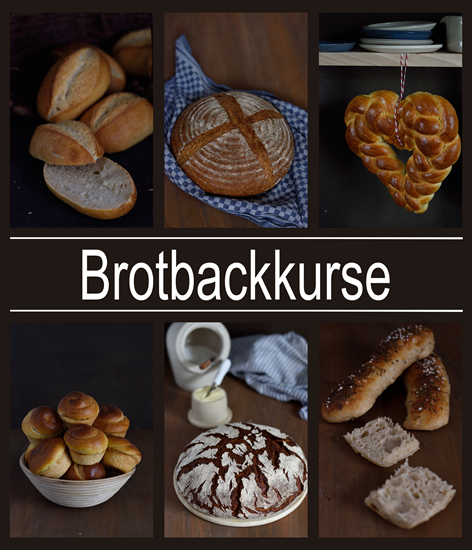 The name “Neujährchen” is used in different regions of Germany for a wide variety of bread and pastry baked for new years eve or new years mornig. This variant stems from the Westerwald. 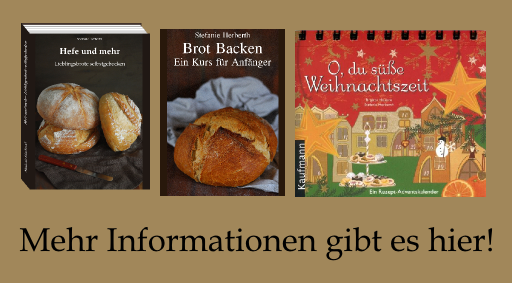 I stumbled about it when I researched recipes for Neujährchen from the rhineland. I was fascinated by the dark crust which is archived by glazing them with cold coffee. 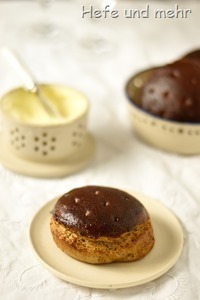 And I was thrilled by the interesting mixture of spices and the fact that it is baked with a good amount of rye flour. The dough is mixed with a generous amount of butter, too, which is rather seldom for rye bread. The mixture of spices seems to vary from village to village. Adding Pepper and cinnamon seems to be common everywhere, but if anise or clove or both is used is different from recipe to recipe. As I do not like anise very much, the decision for my recipe variant was an easy one. The hearty mixture of spice makes the rolls special, but very delicious. They taste great with honey, but would go as well with a mild goat cheese and some cranberry jam, too. 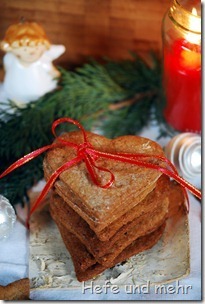 In the last years I tested several speculaas recipes without finding “the one”. I was searching for a recipe which yields tender but crisp cookies. But most of the time I ended up with cookies that where rather hard. And so Charlotte had my full attention when she posted the speculaas recipe from Ottolenghi & Gohs Book “Sweet”. “Terrific” she called them. And so I had to try them instantly. I followed Charlottes advice to cut down the amount of sugar and made some small adjustments in the spice mixture as no one here likes anise. With my speculaas roller I cut the dough into speculaas which worked perfectly with this dough. And in the end, when I sampled the first cookie, I was ready to chime in the choir: they are terrific! The only drawback is, that they seem to evaporate from my cookie bin much to fast. 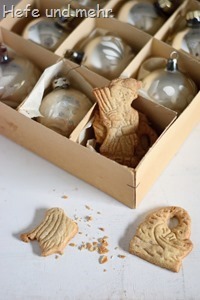 If they keep vanishing in this rate, I have to bake another batch before Christmas…. Honey is a stable in our pantry. There is no weekend breakfast without honey for me. Luckily we have some beekeepers in the family, so we are always well provided. 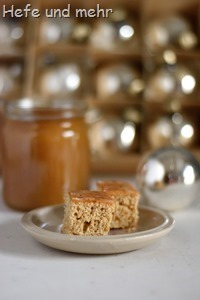 Honey is although a delicious part of Christmas Baking, as for Turrón or Pepperkakror. And so I was hooked when I stumbled over a recipe of soft ginger bread in an old christmas cookbook. and because I read a lot of using rye flour in such cakes lately I decided to modify it a bit and add some rye to the recipe. I tweaked the amount of liquids and spices as well a bit and was then very pleased with the outcome: The ginger bread is soft and fluffy and so delicious that is has to be hidden to survive until Christmas! Who still needs a present for Christmas has to hurry up now. 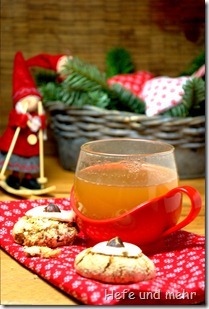 A delicious last minute present for people with a sweet tooth is this Chai Syrup. 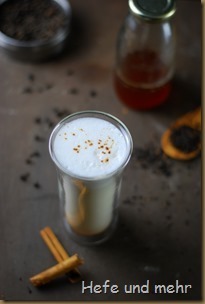 And with a flask of Chai Syrup the next Chai Latte is just a question of warm (maybe frothed) milk. Is everyone still here? Or did the apocalypse happened somewhere? In our little corner of the world the “weather precast for the apocalypse” did not come true (luckily). It is good that I bought my christmas presents already, now I will need them ! This delicious recipe I found on My Italian Smörgåsbord and I had to try it. 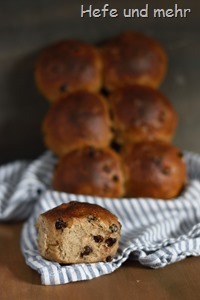 It is packed with nuts, spices, malt and honey and they are very delicious. The next time would just exchange the coconut with some hazelnuts, then they will be perfect for me! Christmas eve is now near. And the nearer this day comes the more I enjoy the fragrance of almonds, cinnamon, vanilla, clove and other spices. 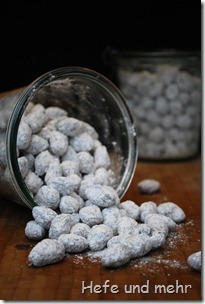 And when I read a recipe for Chocolate Almonds I knew instantly that I has to try this recipe. But – and I knew this instantly, too – that I would have to make spiced chocolate almonds, with cinnamon, cardamom and vanilla – just like the delicious chocolate almonds that you can buy at this time of the year. They are not very complicated to make but to coat them with chocolate needs some time. The chocolate is added in small increments and then the almonds have to be stirred until the chocolate sets. And then the next increment of chocolate is added… And that repeatedly until the almonds are covered with a thick layer of chocolate. It is a similar principal as dipping candles. I like Christmas markets – if they are not crowded – and when I visit one with friends or colleagues we normally end our tour at a Glühwein stand. I do not like Glühwein not so much so I drink one of the non alcoholic drinks their offer. The hot chocolate is often not so good and the qualitiy of the “Kinderpunsch” differs very much from market stand to market stand. This year I tested one that was just made from white grape juice and spices which was not bad but for my taste it was to sweet. And then I discovered the Apfelpunsch stand at the Christmas market on the Altermarkt in cologne. This was very delicious, a not so sweet heated apple juice, seasoned with cinnamon and clove.